The Red Bull Air Race World Championship is competing this weekend in Austria, site of the very first event in the world’s most prestigious aerobatic racing series 15 years. So it’s a perfect time to ask the 14 pilots in the elite Master Class to share their memories of their first event in the Red Bull Air Race. All of these pilots and those flying in the Challenger Class will compete in the Red Bull Air Race on Oct. 6-7 at the Indianapolis Motor Speedway. 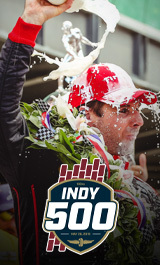 Visit IMS.com for more information and to buy tickets. NBCSN will televise a two-hour highlight show of this weekend’s Austrian round from 7-9 p.m. (ET) Monday, Sept. 17. “My first recollection was actually participating in a training camp at Tokol, Hungary, in 2003. It’s a huge memory. I thought the planes would fly in a circle, but it was more like a slalom. I was impressed how low we were flying, and the pylons came up so fast. They were not a cone shape – they were straight and had cables to hold them upright. I wanted to be very careful not to hit one, because it was not my plane and I didn’t want to leave marks on it! At first, I thought I would never be able to do it, but I got better and better. It was the very beginning of everything, and I will never forget it. In 2004 I officially raced in Budapest, and then from 2005 on I have been at every race.